No deal is like another. And any one deal can take various legal shapes, but you do not have a deal until you have a structure. Depending on the legal terms used, what seems like a straightforward business proposition can have highly disparate economic outcomes. To navigate this process successfully, the lawyer has to think in business terms and the business person has to understand the function and potential of the different legal elements that make the deal. 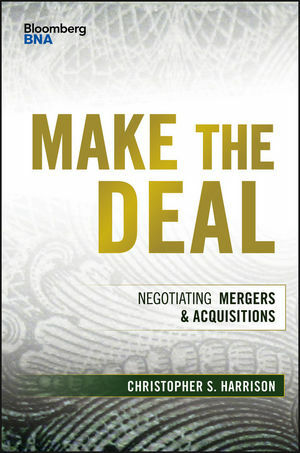 In Make the Deal, Mergers and Acquisition pundit Christopher S. Harrison combines business, finance, and legal expertise to provide an essential and highly accessible overview of the complicated and often labyrinthous M&A process. Showing how legal form conditions the economic outlook, he reveals what it takes to support a business strategy with a legal framework and what the economic ramifications of specific deal terms and their interrelations might be. Intended as a tool for both business leaders and lawyers as well as students who aspire to such roles, Make the Deal not only offers a comprehensive and comprehensible compendium of deal terminology, but also provides a road map of how the various terms interact, how to negotiate one point with all the others in mind, and how to organize a successful deal process. Compelling war stories highlight what is at stake. Sample provisions give examples of clear, effective deal language. And easily readable graphics synthesize exhaustive deal study data to give the practitioner and the student a keen sense for the realities of the M&A market. Make the Deal is a direct and accessible guide to striking a powerful M&A deal. Merging business, finance, and law, this insightful examination of M&A strategy is designed to help you understand M&A negotiations and the ways in which the final outcome affects your financial future. A general overview of an acquisition agreement framework segues into a more detailed discussion of different deal structures, including stock sales, mergers, asset sales, and complex structures, giving you the information you need to know when each one applies best in practice. You’ll gain insight into real-world negotiations and the delicate balancing act that occurs as each party attempts to maximize value and minimize risk, and learn the potential pitfalls that can occur. Negotiation statistics and samples from actual contracts back the war stories throughout, and reinforce the idea that there’s no single perfect solution. As a topic of study, M&A is constantly evolving; in practice, it changes at the speed of light. Staying ahead of the market is the single most critical element of making the best deal, and the strategy that worked for one deal most likely won’t work for the next. Instead of simply providing a list of strategies that have worked in the past, this book shows you why they worked, so you can tailor your strategy specifically to your next deal.